These are our new favorite! 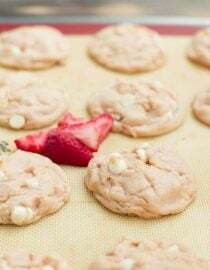 Strawberries and Cream Pudding cookies made with an instant pudding and white chocolate chips! 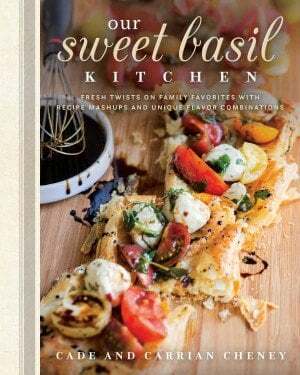 This is one of those recipes that I wish I could reach through the screen and make you try a nibble. I guess that would be a tad creepy though. It almost seems like a horror movie to witness and arm reaching out of a screen. Although when you bite into the world’s softest cookie with the most delightful flavor you wouldn’t care how you got it. 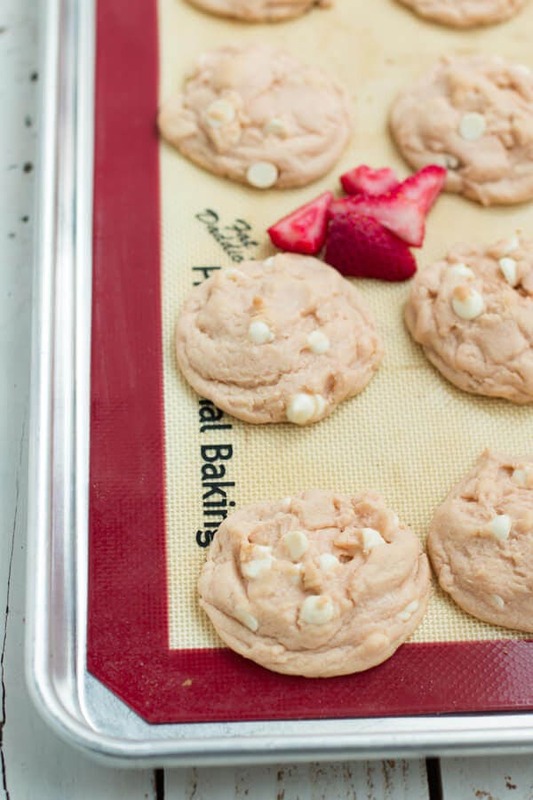 But in the meantime, just trust me on these strawberries and cream pudding cookies. And other than the flavor here’s what really sold us on these cookies, the texture! They are incredible soft like a pudding cookie, but after 3 days of being on a plate with saran wrap they were still perfect! Even our pudding cookies tend to get crisper with time. And let’s talk about Cade and these cookies. If you’ve been reading our site for a while now you know how Cade feels about cookies, but I’ll let him tell you. Whenever Carrian makes cookies I can smell the deliciousness right when I walk into the door and I cannot resist grabbing a hot cookie immediately, but occasionally I’ll come home, smell the baked goods smell and rush into the kitchen only to find another kind of cookie. Now don’t get me wrong, I love all cookies, but I’m always a little heartbroken when it’s not a good, melty chocolate chip cookie. 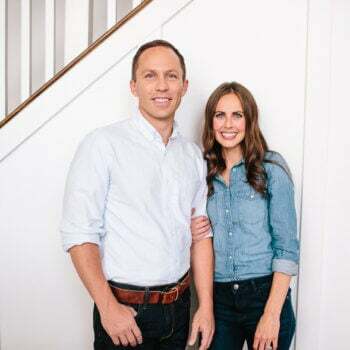 They are my favorite! Watch the video to see it all in action. You just can’t go wrong with a classic like that. So, it was a Sunday night and at our house it means it’s treat day. Carrian wandered to the kitchen and on the way announced that she was headed to make cookies. The girls and I headed upstairs to play hide and go seek while I held back my excitement. And then she called to us that they were done. 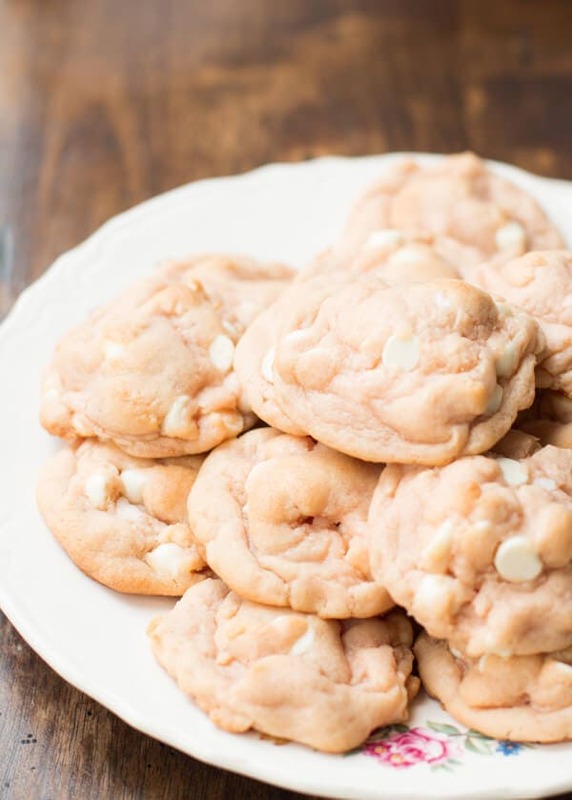 I rushed into the kitchen to find pink and white cookies. Whaaaa? She made me close my eyes and just take a bite before I even dared get sad. And I cross my heart, I was totally wrong to be disappointed! This chocolate lover has been converted. I don’t know what it is about those cookies but I can’t stay out of them! And now I can’t wait for you to try them too! 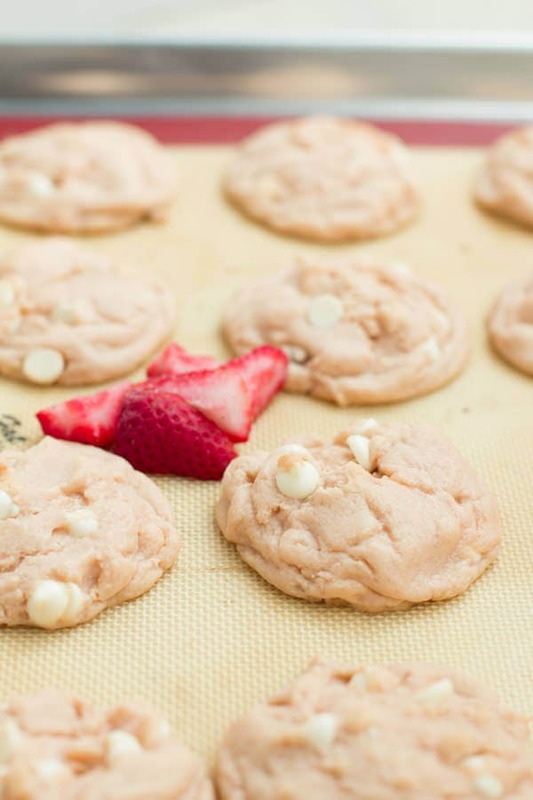 Soft and fluffy strawberry cookies with melty white chocolate chips! Mix until completely smooth, about 30 seconds. Add the eggs and almond extract and mix again. In a small bowl, add the flour, pudding, salt, baking soda, and corn starch. Add to the wet ingredients and mix until smooth. Stir in the chocolate chips and scoop out into balls on a cookie sheet. Beating the sugar with the shortening or butter allows for a fluffier cookie. I’ve looked at 2 grocery stores and have seen no strawberry pudding mix. Are you sure it wasn’t jello mix? Yes, and we always find it at Walmart, but sometimes they take it away for a few months and then bring it back. 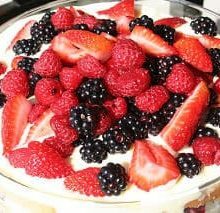 I’ve made a recipe like this before with vanilla and chocolate pudding mixes, but never thought of using strawberry! My sister-in-law loves anything pink and strawberry flavored so I’m sure she’ll love these. Oh for sure drop her by some! I was not able to find the jello brand strawberry pudding mix at the store. However, I bought Royal brand greek yogurt strawberry pudding mix. Is it okay to substitute? We actually freeze most of our cookie dough as our family is so small we can’t get through a batch so I say yes! These are absolutely amazing!!! I love this recipe! Also a big please with my strawberry hating son! They are so so delicious! These sound fun, but maybe a bit too sweet for me. I’m going to try them though, but leave out the almond flavoring, and leave out the while choc chips, and put in walnuts instead! 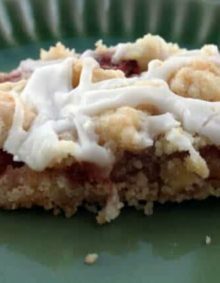 I subscribe to your email and very often I see delicious looking recipes that I want to pin. But I don’t see a pin it button on your website. I also follow you on pinterest but sometimes I don’t have the time for that. Lol. Will you be adding a pin it button? 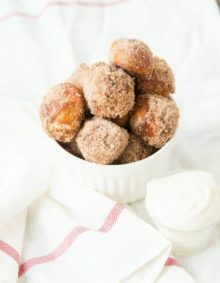 These look wonderful and I can’t wait to make them!! Do you recommend chilling these cookies prior to baking? These sound amazing! After Cade’s testimonial, I’m definitely sold! Love! I need to make these now! These look delightful and so summery. Yes, I’m trying to hang on to the last bit left before fall arrives…I don’t think I’ve ever seen strawberry pudding at the store, but will have to look next time I’m there. Is it Jello brand? It is and it really is one of our new favorites! Oh i can’t wait to give these a try. 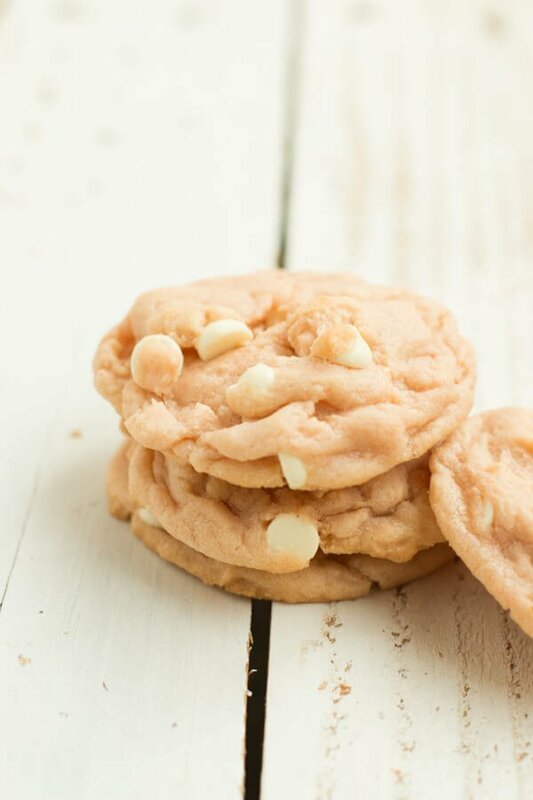 I have a banana cream pie cookie recipe with banana pudding mix so I just know I will love these. Yum yum yum! My husband would also enjoy these cookies. He’s a huge strawberry fan. I need a dozen of these just for me! Also, the arm reaching through the screen? Totally not creepy…and actually would be welcomed because my face NEEDS these! Pinned!